You've got 3 stuns, just stunlock them all. Yes, stun is the key. You might lose Old Ben though. He can take 3-4 hits. Did you not read what I wrote? I don't have problems finishing the event. The problem is that it's supposed to be a training event but it doesn't accomplish the goals it should. You won't get 45k dmg with basic ability in such situation in arena for example. Exactly what tranining is about. You won't get better, because you train by beating someone weaker. If you beat a tougher enemy, you improve. That's what training is about. They're also fast enough. On my first try, the first taunt of the Stormtroopers occured when only them and Vader left. I sacrificed Old Ben, because I got unlucky once, couldn't stun Vader, so he could do his Force Crush. I had to taunt with Ben to save the others, but I didn't mind, 'coz his death gives buffs. Palp was not even getting one turn. TL;DR: Focus on stuns and TM manipulation instead of kill order. Sacrifice OB if needed. - Don't forget that CLS can stun those enemies with his basic who have Defense Down. If you combine this with his Call to Action ability, you can use this stun even when Stormtroopers are taunting (but if you do well, Stormtroopers will only taunt when it's too late). His basic also gives Speed Down, which can help you get more turns before the enemy, thus more chance to stun. - You can use CLS's Use the Force early on one of the Stormtroopers if you don't urgently need to remove TM from Vader/Palp/Thrawn. Buff Immunity means you don't have to worry if that given Stormtrooper gets a turn. - R2 is there for stunning. Period. I used Improvse (burning) only once, when it doesn't mattered, 'coz only the 2 Stormtroopers were left, while I used Smoke Screen zero times. - I say, don't care about kill order, care about TM. Except for Leia, always attack that enemy who has the most TM, unless he/she is stunned. If stunned, attack the enemy who has the second most TM. - Han: He is your other main damage dealer, but you should rather focus on his stunning and TM removing capabilities. I know it's tempting to kill Palp first with his double shots, but his ability to remove TM (and to stun) is MUCH MORE important. - Old Ben: He basically serves two purposes, just like in the movies. 1: Providing the life-saving Ability Block in his FIRST turn (that is disabling the tractor beam on Death Star). This is really important. At the beginning of the battle, let your other toons stun/remove TM from everybody who would attack before OB, so he can apply AB. 2. Sacrificing himself if Vader gets to use Culling Blade. (I hope I don't have to compare this to the movie ) If you see that coming, just taunt. This was hilarious. I can't win. Probably about 20% RNG, but about 80% of RTFP. Which is far more important. I simply read their abilities, figured out what would benefit me in the long run (limit their turns through stun and TM removal) and accomplished this outcome on my second try. Blaming the game for you not being able to understand synergy is just lame. It's as simple as someone said earlier: "get good". Read the fine print. Hold your finger on their abilities and see if it's the best choice at that particular time. Great thread and event. Having everyone on a level playing field is fantastic and genuinely challenging. I've tried and tried and can't do it. I get the theory, totally. That you got 3 stunners and 2 TM manipulators. I've tried. I focus on the TM line more than anything else. I work against that. Nothing else. And all goes too plan...until the Storms start taunting. Then Ben usually gets whacked first, then another, then another and I quit. Can't help thinking that RNG is somewhat more important than method on this event...and maybe all, really don't know. I will have a few more goes because as far as I can see I am doing everything "right". And it's still not working. You'll all be pleased to know that the Tier 3 Empire Event is a cakewalk. I simply read their abilities, figured out what would benefit me in the long run (limit their turns through stun and TM removal) and accomplished this outcome on my second try. I did the same and still not managed it on my fourth try. What do you put that down to if not RNG? The strat that worked for me and a lot of my guild mates is keeping vader and palp stunned and focusing thrawn down. Use CLS to clear taunts if one of the Stormtroopers gets a taunt off. Ok, so I got Thrawn and EP down that time! Same again - CLS and Leia again the last ones standing. But whacked. Put buff immunity on both of the stormtroopers. Use old ben mind tricks whenever possible. Limit the number of turns stormtroopers take. Don't stun them, stun only the big three. But dont let stormtroopers get full tm. Use han basic, cls basic, special, obi's MT to bump their tm down. If any of them taunts, make sure you have cls second special ready. Use call to action wisely, it reduces use the force's cd. Now keep stunning the big three. Leave tfp alone, he's useless. Strategy for early game: Stun thrawn. Smoke on r2. Leia does the same thing all match. Luke buff immunity on ST. Han stunning palp. Obi wan mind tricks. Everyone is hopefully low tm and AB now. Use your mind, don't just press buttons all match. Don't leave it up to rng, take the charge and make sure you finish it in one go. TLDR: Knock tm off stormtroops. Stun the bug three. Its an easy event, albeit long. Don't let a failure or two demotivate you. Thank you @Kiritoismyname , and all others. Great battle and challenge! I can't even kill 1 unit. Thrawn 1 shots everyone he attacks. Is this just a lesson in what a bad rebel form is? Use stun to keep thrawn, vader and palp in check. stun thrawn and TM wipe Palp. Mind Tricks on everyone and get ability block on one Stormtrooper. TFP will kill himself with his Aoe (or you can finsih him off. Alternate stuns between thrawn and palp and kill off the stormtroopers. Kill Palp. Kill Thrawn. Kill Vader. You have 2 TM Manipulaters and 3 stuns. Merged into "Rebel training T3" thread. Loads of great advice here. Thanks, all. Finally got through this with your advice. stunning thrawn, vader, and palp whenever you can. use lukes basic only till storm taunts then use call to action. but stun...stun...stun! and this from a sith main player, this advice does work takes a while and if you miss once yeah it does hurt but i made it through with everyone at or above 50% health. 1. Watching every TM of the five important enemies. Every time one is creeping up, bring it down. That's the most important thing to do. 2. As part of the above - stun whomever's TM is closest to causing action. TM reduction and stunning of the five important enemies. Slip in shots against the big three in between doing the above two things. I dug it. I'm not the most sophisticated player and like blowing things up in big explosions and killing everything as quickly as possible but this challenge made me think a lot about playing. I enjoyed it. This was really fun. If you know how to play Rebels this should not be a problem. 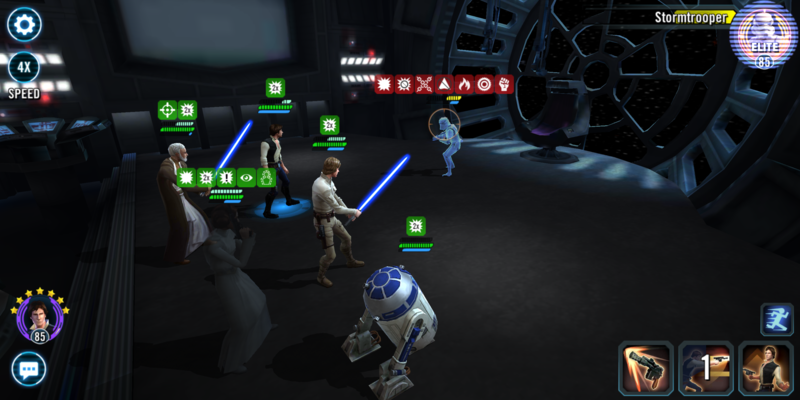 You don't even need stuns, if old Bens ability block is on st, Vader, ep or thrawn. So seah it's difficult, when you're going over pure damage. Use the abilities and this event should not be a problem. Is it just me, or do you basically have to ignore all the "training" they gave you to beat tier 3? I beat it on my main account more or less by following my normal play. My alt, well that still eludes me. These events really are about knowing the toons and their kits. I struggled at times with Rebels, since I don't use any of those regularly. Empire was a breeze, since I use them frequently. First Order was a bit challenging, since I'm not familiar with most of them. Resistance, well, I see why zFinn-led res teams get so much praise. It's a great learning tool, that give you shards (or shard store points). It is a creative way to expose us to the teams, without making us farm them.